As concerned UCT alumni we would like to offer a perspective of the UCT convocation beyond the narrow one that has been doing the rounds. Submitted by Lorna Houston, Stephen Langtry and Mary Ann Naidoo on behalf of a number of other “concerned progressive alumni”. The narrow perspective of the UCT convocation that has been doing the rounds assumes that the historical ways of engaging at the university (usually hierarchical, patriarchal i.e. colonial) are the only acceptable ones. It assumes that a “business as usual approach” – unaffected by the recent history in which students protested against the mechanisms of exclusion (in the form of financial as well as structural and systemic mechanisms) and were met with resistance from those who are invested in, and would protect, the status quo – is desirable. This narrow view fails to take into account the different experiences of and relationships with UCT which shape our visions for what a decolonised UCT, free of the privileged hegemony that persists, might look like, sound like and be like. It also appears to oppose the notion that students may engage in robust critique. Yet, what makes higher education “higher” is that students are encouraged and taught to engage critically with the disciplinary content in their studies. They are taught and supported to weigh up, evaluate, assess and critique. Critical citizenship is one of the four “purposes” of higher education as captured in many policy documents internationally, and our own White Paper of 1997. As alums, we recognise that the capacity for critical engagement is one we should support in current students, particularly where this is being employed in support of broader goals of social justice. We are thus saddened to see this critical engagement devalued and decontextualised, as it was at the recent meeting of convocation. We would urge the university to consider a more dialogic model for the conduct of future meetings that celebrates the special capacities nurtured in us through higher education – particularly the ability to engage critically – rather than demanding blind obeisance to an arcane system of rules many find alienating, silencing and marginalising. If the university is serious about transforming, it needs to find a way to ensure that all voices can be heard, not only those already amplified in the echo chamber. This is why, as concerned alumni, we believe that the events at the convocation, and the narrow view of the evening being circulated, is an indictment on us as members of convocation. In broadcasting this narrow perspective, we are not honouring the students, staff and executive who face the manifestation of colonialism head-on, on behalf of this society. And this is why we would like to remind you of the vast differences that we as alumni have experienced at the university. To start with, many of us did not experience UCT as our “home”. We have buried our cumulative trauma and focused on issues outside of the university. To be alumni was merely a fact and not a relationship. This is different for alumni who did not have stepchild status at university and in society, and who maintained their relationship with the university in some way. This unspoken difference needs to be taken into account when those set themselves up as judge, jury and/or jailers of dissenting voices. We invite particularly those who expressed their disgust, dismay and sadness about what has perjoratively been described as a “chaotic” meeting; to take a deeper, broader, and longer view of the 2016 Convocation AGM as fellow human beings with starkly different experiences, and not as “us” and “them”. We invite you to acknowledge that the structure that favours you is largely invisible to you. That it is threatening to delink from the structure and to dismantle it from the inside – for the common good. That it is easier to personalise, interpersonalise and escalate this conflict to intra- and inter-group levels, than to acknowledge complicity in a system of uninterrupted privilege. Student protests challenge our collective denial. Since 2015, many of us had to confront our hidden shame when protesting students started to “name” and articulate those experiences that we could not find a language for during our time(s) at UCT. 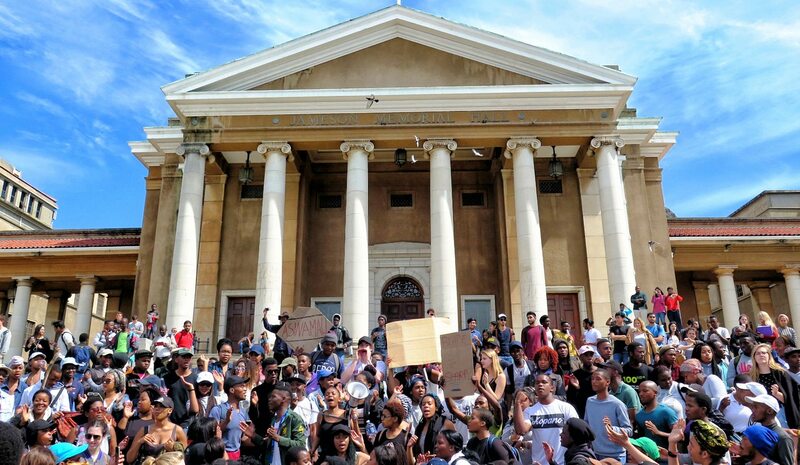 Students have brought to our attention how the past is still present, despite UCT’s stated attempts at transformation. They have articulated the many invisible and visible ways in which institutional racism manifests in ways that are written off as anecdotes. During 22 years of “transformation”, the UCT system managed to “disappear” and exclude many capable black staff; and instead nurtured mainly capable white staff by providing support, mentoring and the transmission of social capital to negotiate the system. Many regard it as outrageous when students “disrespect” council, convocation, exams and other processes considered important, by disrupting the colonial order of things. Few question why young people with so much to lose put their bodies on the line in the ways that they do. It is our duty to connect the dots between past and present “anecdotes” and to help render past and present continuities visible so that it can be dealt with by all of us. This would be an act of restorative justice, to de-centre whiteness, and to encourage progressive white people to find ways to delink from privilege and to dismantle the structure from within, instead of regarding themselves as victims. The past is still present. We do not pretend to have the answers, but we seek to start a conversation about the invisible ways in which our attempt to return as alumni is confronting us once again with the past that is still present in subtle and unsubtle ways. For example, we find that we are silenced by “rules” that favour a legalistic rather than a dialogic approach. The invisible effect of these unquestioned rules (Roberts Rules, 1915) were evident during the 2016 AGM when a staff member was effectively silenced by the “closure” proposal. This is a power-based approach which favoured people who wanted to vote and go home. A straightforward matter to them, but not to those who are the “preferably unheard” and who then use their agency to “force” a situation where they can be heard and/or ensure that unquestioned power and privilege is frustrated and disrupted. We do ourselves no favours to individualise, pathologise and criminalise these manifestations of resistance. The lecture theatre was full for the first time in years because of the motion of no confidence before the 2016 Convocation AGM. Professor Crowe’s motion was essentially an appeal to rules that individualise and punish. The restorative justice approach shows an understanding of the structural nature of the conflict and goes to the heart of the uneven application of legalistic and dialogic approaches. Those same people who are regarded as disruptive, are teaching us that an agenda for social justice requires hawks and doves to secure the peace – for all our sakes. No peace agreement that is worth its salt has ever been achieved without pressure from a “radical flank” who provide the doves with cover to negotiate a just settlement. Photo of UCT by GroundUp.